BUYSOUNDTRAX Records presents MAX AND HELEN/THE OASIS. 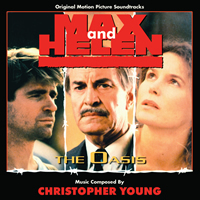 The album features music composed by Christopher Young for MAX AND HELEN, the 1990 television drama directed by Philip Saville, based on the book by Simon Wiesenthal, starring Treat Williams, Alice Krige and Martin Landau along with music composed for THE OASIS, the 1984 drama directed by Sparky Greene, from a script by Tom Klassen, starring Chris Makepeace, Scott Hylands, Richard Cox, Mark Metcalf and Anne Lockhart. MAX AND HELEN takes place in 1962, as the famed Nazi hunter, Simon Wiesenthal, is building a case against Werner Schultze, the feared commandant of Zalesie, a labor camp in Poland. During the course of his investigation, he finds Max, a survivor of Zalesie, who is reluctant to implicate Schultze. Upon learning the truth behind Max’s decision not to testify against his captor, Wiesenthal must choose whether or not to continue to prosecute Schultze for his war crimes. For MAX AND HELEN, Christopher Young wrote a score that combines solo voice, sonic manipulations, ethnic folk music and interpolates Max and Helen’s favorite piece, Chopin’s Piano Etude No. 3 in E. The end result is a score that literally holds the film together. THE OASIS, also known as SAVAGE HUNGER, is a disturbing story of nine strangers who survive an airplane crash in the Mexican Baja desert. The film probes each survivor’s reaction to being stranded in the desert. As the veneer of civility dissolves away, each person is faced with the critical question of survival. The score for THE OASIS is divided into two categories: tonal orchestra and nontonal percussion. The orchestra is used for the emotionally charged moments while the percussion section is used primarily to emphasize the desert and the mental deterioration of the survivors. THE OASIS was the fourth film scored by Christopher Young. Golden Globe-nominated composer Christopher Young has scored nearly 100 films, including films such as HELLRAISER, JENNIFER 8, MURDER IN THE FIRST, COPYCAT, SPECIES, THE HURRICANE, SWORDFISH, THE SHIPPING NEWS, THE HURRICANE, THE CORE, THE GRUDGE, THE EXORCISM OF EMILY ROSE, SPIDER-MAN 3, UNTRACEABLE and the forthcoming films, THE UNINVITED and DRAG ME TO HELL. Born in Red Bank, New Jersey, Young graduated from Massachusetts Hampshire College with a BA in music and did post-graduate work at North Texas State University, studying big band writing and classical composition before moving to Los Angeles in 1980. While enrolled at UCLA, he studied with famed film composer David Raksin. In addition to his career as a film composer, he has also taught composition at UCLA. BUYSOUNDTRAX Records presents MAX AND HELEN/THE OASIS, featuring music composed by Christopher Young. Both scores have been released previously on compact disc but those releases are long out of print. Both MAX AND HELEN and THE OASIS are presented here newly remastered by Digital Outland. MAX AND HELEN/THE OASIS is a limited edition release of 1000 units.